Prairie Vision is located next to the McDonald's and A&W in Wainwright, Alberta, which is southeast of Edmonton along Highways 41 and 14. Wainwright, Alberta boasts Canada's third-largest stampede! For over 20 years, our team of eye doctors and staff continue to bring family vision care services with the latest in eye care technology to the Alberta and Saskatchewan communities. To meet the visual need of every patient, our staff emphasizes personal, warm, and attentive care from beginning to end. 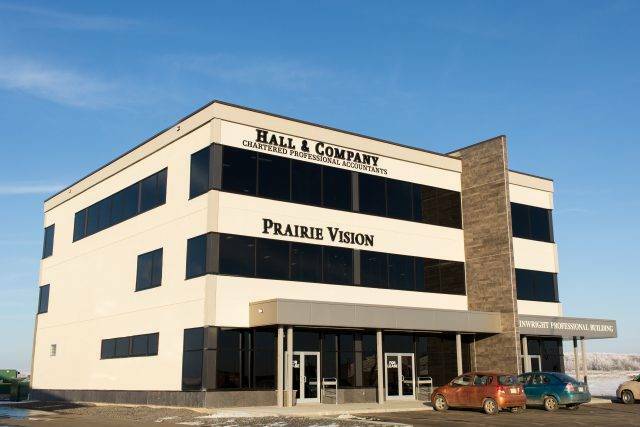 Whether you come from Vegreville, Viking, and even as far as Edmonton, the health of your eyes is our top priority. From comprehensive eye exams by professional eye doctors, patient-focused staff, and advanced eye care technology, our patients routinely come to us for their annual eye exams and vision issues. We also offer the most popular designer brand frames to suit the needs and lifestyle of all our patients. Call us to make an appointment with one of our eye doctors to talk about your eyeglasses, contact lenses or specialty lens needs, as well as any other vision issue you may have! We also accept gift cards.